Today’s lesson is about Japanese culture more than languages. = Baiorin wo keiko suru. = Kyou wa piano no okeiko wo shinai to ikenai. = I have to practice on piano today. It is usually used for Japanese martial arts. It would be a bit strange to use this for modern sports such as サッカー ( = sakkaa ) soccer, テニス ( = tenisu ) tennis , バレーボール ( = bareebooru) volleyball. etc. We use 練習 ( = renshuu) instead. “どや! ” ( = Doya!) which is Osaka dialect for “How’s that!” proudly when you show off something. Many children take educational cultural lessons such as piano, violin, ballet, English, etc. even at at a very young age in Japan. 2) There are classes targeting very young age called 幼児クラス = youji kurasu = infant class. 3) 学習塾 = gakushuujuku = cram schools are not counted as (お)稽古ごと = (o)keikogoto. 4) They take one or two (or more) cultural lessons a week after school. We have more choices now but お稽古ごと ( = okeikogoto) has been in Japan for a long time. = Otaku no okosan wa nanika okeiko goto wo sasete imasuka? = Do you make your children take any lessons? = Uchi wa nanimo okeigototo wo sasete imasen. = We don’t make our children (child) take any lessons. = Uchi wa shuu sankai okeikogoto wo sasete imasu. = We make our child(ren) take lessons three times a week. = Kyouwa piano no okeiko ga arukara mou kaeranaito. = I have a piano lesson so I have to go home now. there is even magazines or sites for お稽古ごと ( = okeikogoto ) listening up all the cultural l lessons. They used to be essential for 花嫁修業 ( = hanayome shugyou ) training to become a good wife. to get the better job. There are a lot of スクール ( = sukuuru) or 教室 ( = kyoushtisu ) = schools which provides variety of subjects. = Kongetsu wa okeiko goto de isogashii. = I have been busy with all the (cultural ) lessons. = Okkeiko goto ga ookute okane ga nai. = I am running out the money because of all the cultural lessons. = Ima nanika naratte iru? or naraigoto shiteru? = Are you taking any classes now? = Eikaiwa wo naratte imasu. = I am taking English lessons. 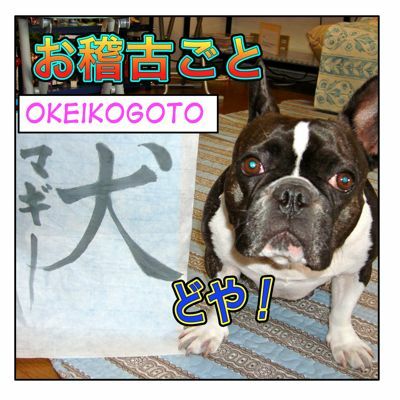 * If a man takes a cultural class, do we call it as お稽古ごと ( = okeikogoto) ? It is possible but it may sound a bit feminine. = I go to 〜 school. = Minna no kuni niwa kouiu okeikogoto ya naraigoto no shuukan wa arimasuka? = Do you have this kind of custom of taking cultural classes in your country? Hi Maggie sensei, thank you very much for the lessons!! May I ask you a question? In your example above, “おたくのお子さんは何かお稽古ごとをさせていますか？” means “Do you make your children take any lessons?”. However, I learnt from another sensei that “watashi wa kato-san ni unten saseru” means “I make/let kato san drive”. In your example, “your children” is in front of は, but in his example “I” is in front of は. I am sure both examples are correct, but why the difference? In one example, the “weaker” person is in front of wa, but in the other example, the “stronger” one is in front of wa. Right, Someoneに〜をさせる (あなたは、お子さんに何かお稽古事をさせていますか）　is the correct form. If you study for the JLPT exam, you stick to the form. As for your children, do you make them take any lesson? I will show you other simple example. Did you already have breakfast? You use を for breakfast because it’s an object of an action, eating. (literal translation) As for breakfast, did you already have? Also you often omit the subject あなた. This is my first time reading Maggie Sensei’s blog and i really like it. The post is full of knowledge and people will not have chance to learn this in class i guess (im not attending any japanese class though. Hehe). Hi, thank you for visiting this site. I am glad to hear you like it. Good luck for your final exam! Please come back between your studies. More specifically things like slangy grammar contractions (ex. 〜えば becoming 〜や、 見ればー＞みりゃ)? Thank you for visiting this site! Also thank you for your first comment! :h: I have posted a couple of lessons of casual contractions ~ ん+なきゃ／なくちゃ+, ちゃう＋ちゃった,etc. But there are more. I will make more lessons in future. Will find another interesting song to study with,too! Thank you for your feedback and please feel free to leave comments anytime!